Hi everyone! I'm so excited to share today's post, because it's something that I've been working on for a while. One question that I've gotten a lot since going vegan is "what do you eat? doesn't it get boring? what about lunch?" Today's post is all about that - it's a full week of vegan lunches! I hope that in this post, I can show you that there is so much variety and choice with eating vegan. I'm feeling so inspired to come up with fun and exciting lunches. I love all of the beautiful colors in each picture, and I can tell you each lunch was incredibly satisfying and delicious! For each day, I'll be sharing a main dish and three sides. I'm using the Rubbermaid Lunch Blox container (I love how all the pieces snap together, and it comes with an ice pack that fits between the layers!). P.S. This is not a sponsored post, but that is an Amazon affiliate link! 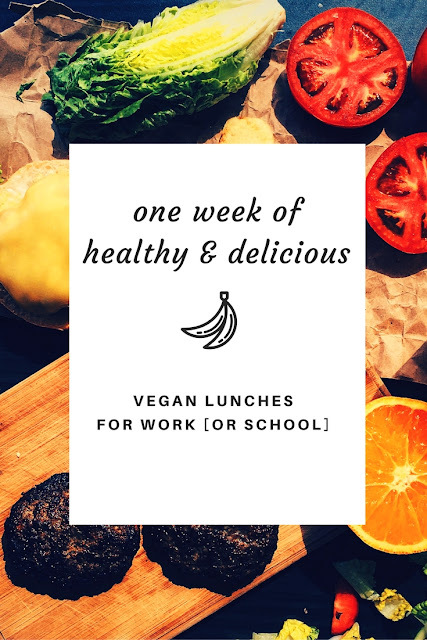 I hope you enjoy this post, and get some new lunch ideas! Come back tomorrow, where I'll talk all about why I became vegan! Thank you for sharing these!! I'm always in a rut for lunches. Plus, I like to go meatless once a week, so these were some great options. I'm so glad you liked the post Elle! These look delicious!!!!! I'm having serious lunch envy right now, glad vegan is working out really well for you. I'm interested in reading your post about becoming vegan and from a dietitian's perspective I'm interested and how you feel eating vegan vs when you did whole 30- such contrasting diets. Yes very different! What I like about both diets is the emphasis on eating plant based food instead of processed. Both made me feel great! This is SO FASCINATING. It also looks like so much work, but I guess making our health should be a priority, hey? Have you seen how disastrous my food post is from today? I'm actually disgusting. These all look delicious!!! That skillet mac looks similar to what I made for lunches this week. Though, my recipe wasn't vegan. I've been really considering eating vegan for just like 2 weeks to see how my body responds. These are all such great, healthy meal ideas! I also LOVE those Trader Joe's pizza crusts...my boyfriend and I always do date nights in putting our own toppings on them! I would love to hear how you like going vegan! And yes..those TJ's crusts are the best! Yum!! Does trader joes have gf pizza crusts? I believe they do, but I haven't tried them yet! I love making quinoa bowls! This is making me hungry now! All of your lunches look so SO good! I love that you have a mix of savoury and sweet and all sorts of different textures every day! We loooooove quinoa over hurr! That Thai salad sounds delicious! You should try it..it's so good! i love seeing what people eat for lunch, vegan or not. lunch is where i struggle the most! putting mushrooms on top of the burger is brilliant! i need to try that. and the first veggie burgers look yum too.